Hi everyone!!! 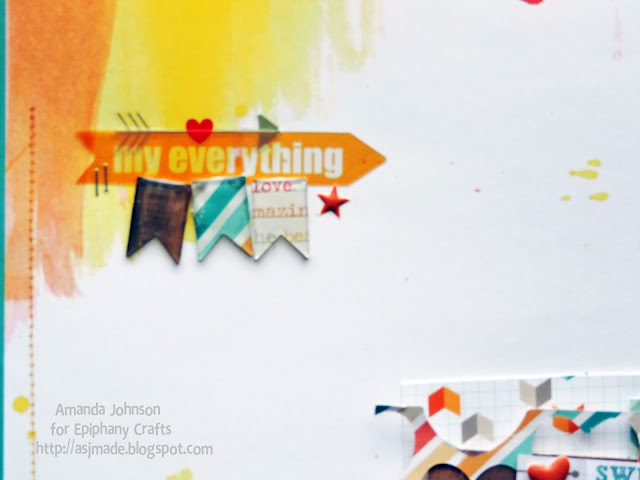 I'm here today to share a layout with you that I made for the Chic Tags and Epiphany Crafts team up. I was so super excited when I found out we were doing a team up, and I was even MORE excited when I saw that I had gotten the Happy Place collection to play with. It had been one of my favorites, and I just hadn't had a chance to pick any up yet. I knew instantly what photo I wanted to use, and how I wanted my layout to come together. Lots of fun colors and layers! Since I was using so many layers, patterns, and colors I converted my photo to black and white. This was so it wouldn't be in competition with all of the color, but it would still stand out center stage. I used the text patterned paper to create some custom brads that highlighted a few words that described this photo perfectly! I wanted to use the "My Everything" clear embellishment for my title, but I wanted to dress it up a bit. So using my shape studio pennant 25 tool, I created a few little banners to "hang" from the bottom of the title. It gave it just enough interest, without taking away from the photo. Make sure you stop by the Epiphany Crafts and Chic Tags blogs all week to be inspired and to enter for your chance at a couple of great giveaways!! Have a great week, and take time to create something you love!! Love how you used that Chic Tags collection Amanda, the little touches inside the cut out circles, is fab.